Brussels sprouts are a sentimental vegetable for me. My friends and I had parties, or dinners I guess, centered solely around cooking sprouts. Music blasting, we attempted to recreate our favorite appetizer from a vegetarian Thai restaurant. I believe we were successful, but nothing compares to the real thing. I want to note, I used olive oil for this recipe. Some people might not realize this, but when you cook with oil you want to be conscious of the smoke point. The characteristic temperature at which a fat breaks down and smoke when heated is called the smoke point. Essentially, if you reach the smoke point you risk ruining the flavor and forming free radicals. The smoke point of extra virgin olive oil is 375 degrees. If you choose to cook with it, I suggest roasting at 350 degrees. If you’re looking for a oil with a higher smoke point consider grapeseed oil (420 degrees) or avocado oil (520 degrees). Know that coconut oil has a very low smoke point (350 degrees). This recipe is Christmas inspired (notice the color theme). I would suggest making it as a side (unless you’re also into having sprout parties). The pomegranate glaze adds a sweet touch and the seeds creates the most satisfying citrus crunch. Preheat oven to 350 degrees. 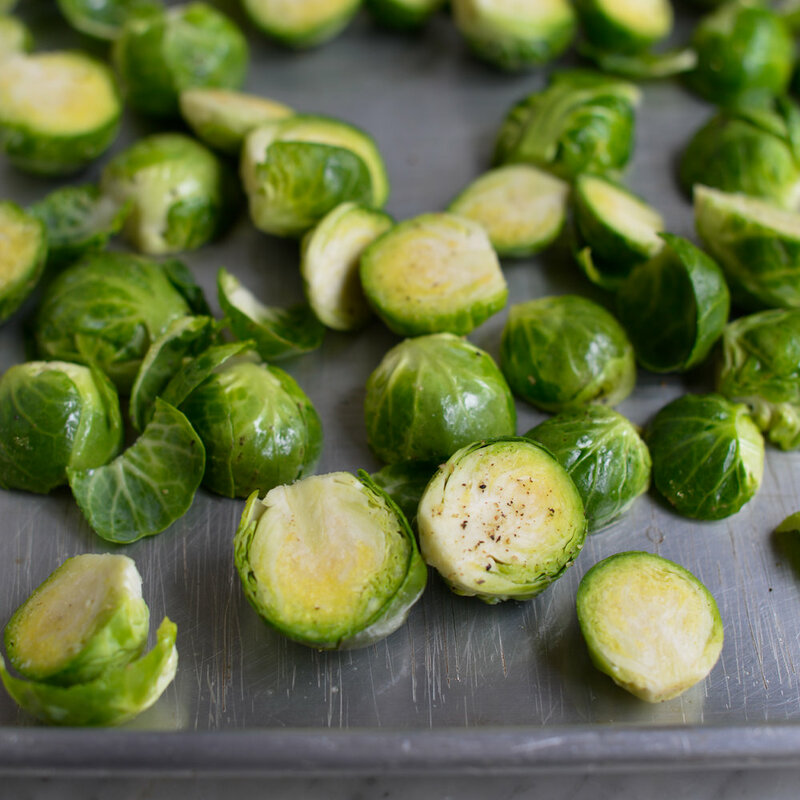 In a large mixing bowl toss the brussels sprouts with olive oil and pepper. Spread evenly (to ensure crispiness) on a tray that is coated lightly in olive oil. Place the tray in the oven. 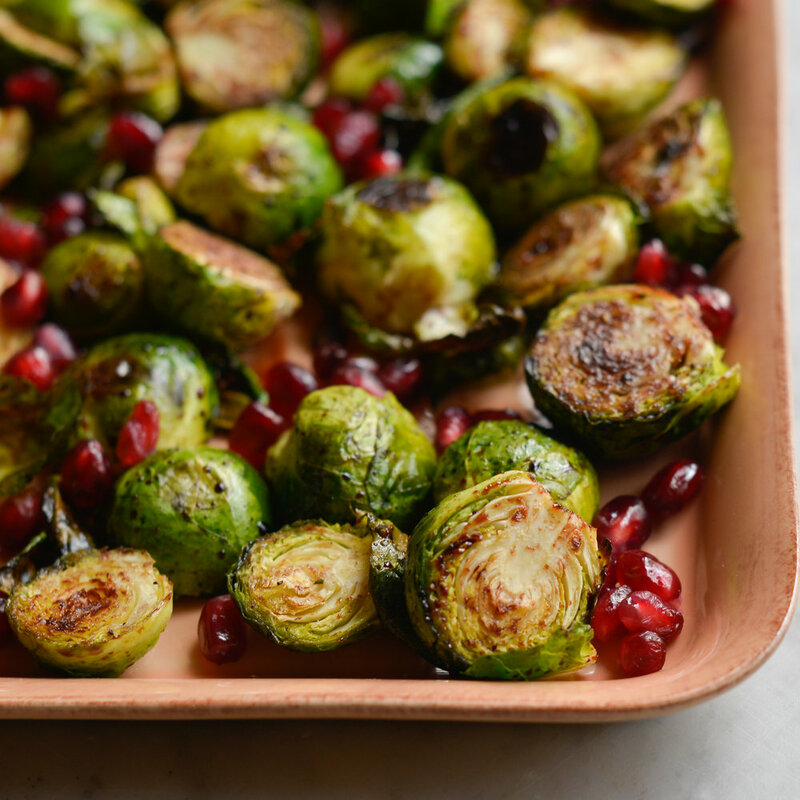 At 15 minutes take the tray out and flip the sprouts with a spatula or tongs. Place the tray back in the oven for another 5-10 minutes. I personally like my sprouts crisp, so I cooked them for 25 minutes. If you prefer them tender, cook for an additional 5-10 minutes. When you’re satisfied, place the sprouts on a serving tray. Drizzle the pomegranate glaze and sprinkle the pomegranate seeds and sea salt to taste.